A photograph from the early 1900s. In the early days of its history the land was known as the "Swine Green". The Green has been owned for centuries by the Townlands Charity. In one of the Church magazines the Reverend Foord-Kelcey writes of a paper being found dating from 1802 with a plan attached showing the brook running straight across from Wright's factory to the right of the lock-up and then back by a sharp turn to the "little bridge". He also makes mention of a Brief showing an unsuccessful action bought by the Earl of Huntingdon in 1726 against the Town Trustees (Townlands Charity) challenging their right of ownership of the Village Green. The Brief makes reference to an Enquiry held in 1631 to settle what lands actually belonged to the Town Lands Trustees. Witnesses were called and we have preserved an idea from their testimony of how the land appeared 150 years before 1726 ie in the reign of Queen Elizabeth the first. 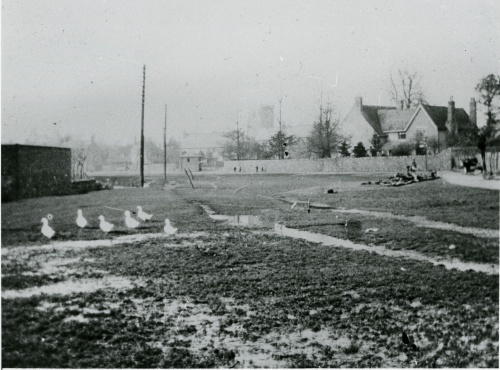 It consisted of the same ground as now (although it is now largely turned into a car park), but the course of the brook was different. It was so swampy that only willows could be grown on it and the pigs of the village routed about and wallowed in its mud.